JUNE 16: VIGIL DIVINE LITURGY (SN) – 4:00 PM; JUNE 17: DIVINE LITURGY (SCM)- 10:30 AM’ JUNE 19: DIVINE LITURGY – CANCELLED; JUNE 20: DIVINE LITURGY – CANCELLED. 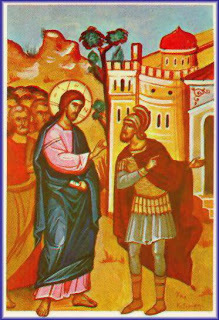 This Sunday’s gospel readings for Divine Liturgy – The Gospel of Matthew 8:5-13, addresses The Faith of the Centurion who asked Jesus, while he was in Capernaum, to heal his servant and which Jesus marveled at the Centurion’s faith. Likewise, Jesus is calling each of us to step out of our comfort zone and live the kind of life that He is asking us to live. This is not an easy life. 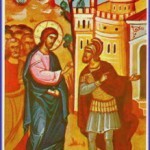 It was not easy for the Centurion in today’s Gospel to come forward and ask Jesus for help but he did it because he had such great faith that he knew that Jesus would grant his request. We are being asked to live an extraordinary life for Jesus. To live for someone other than ourselves. To place our life in His hands and trust in Him that all will be okay. Are you willing, today, to take that step that is necessary to live your faith and not just practice it? On June 19th we commemorate St. Jude Apostle. Jude was the brother of St. James and son of St. Joseph, Betrothed to the Theotokos. Sometimes he is called Levi or Thaddeus. He protested along with Simon and Hosea when the elderly Joseph wanted to leave a portion of his estate to Jesus upon his death. He was often called ‘brother of James’ out of humility and shame for he did not believe in Christ at first, yet St. James did. He was one of the Twelve Apostles (not to be confused with the Thaddeus of the Seventy Apostles) and after the Ascension he preached the Gospel in Judea, Samaria, Galilee, Idumea, Syria, Arabia, Mesopotamia, and Armenia. While preaching in the area around Ararat he was captured by pagans, crucified and killed by being shot with arrows. He is referenced in the Synoptic Gospels, the Acts of the Apostles, and wrote an epistle which is part of the New Testament.